Carbon X-Drive on a polyester/mlyar base laminate that has a taffeta layer (light-weight finely-woven polyester cloth) on the side opposite the carbon tapes. This mainsail has a one meter wide strip of taffeta over the mainsail leech for extra durability. 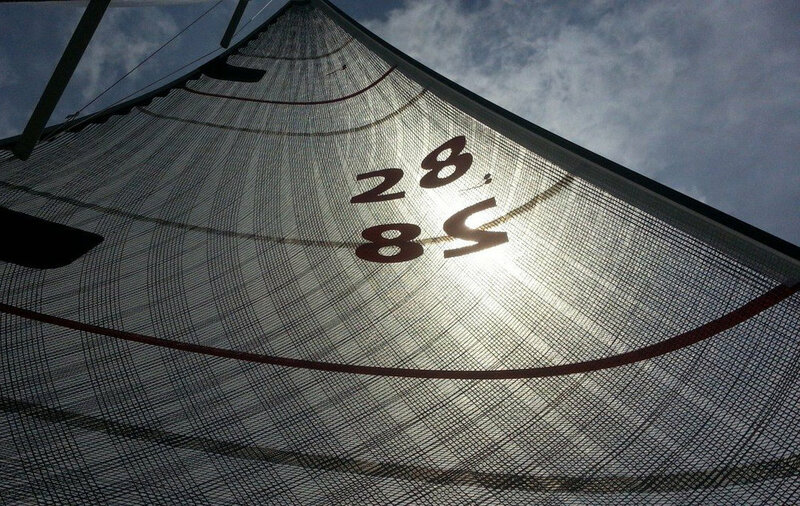 X-Drive® is UK Sailmakers' fastest selling sail construction method because it X-Drive sails are reasonably priced racing sails and long life cruising sails. The concept is a great leap forward from our time-tested Tape-Drive® sails, which proved themselves on the water for three decades. Like Tape-Drive, X-Drive sails can be made with low-stretch fiber-reinforced tapes made with either carbon fiber or glass fiber yarns. These yarns run continuously from corner-to-corner to support the primary loads in the sail. Think of this tape grid as if it was the steel skeleton in an office tower. The steel structure holds up the building and the glass exterior walls define the visible shape. The difference between X-Drive and Tape-Drive is that Tape-Drive sails have fewer tapes containing bundles of yarns. X-Drive sails are made with hundreds more smaller tapes each made with a single yarn. In an X-Drive sail, the coverage of tapes across the surface of the sail is nearly complete. The gap between tapes is miniscule. The major increase in primary fiber coverage has resulted in a tremendous side benefit ... the base materials absorbs significantly less secondary and tertiary loads, enabling us to use a more durable and economic base material in the construction of X-Drive. Increasing fiber coverage has greatly heightened the flying sail shape retention ... all while keeping the structure respectful of your bank account. See photos below showing the increased density of tapes. An X-Drive genoa showing the almost complete tape coverage over the surface of the sail. A Tape-Drive sail showing less tapes that are made with thick bundles of yarn. Left: Close up of carbon tapes on a black aramid/mylar laminate. 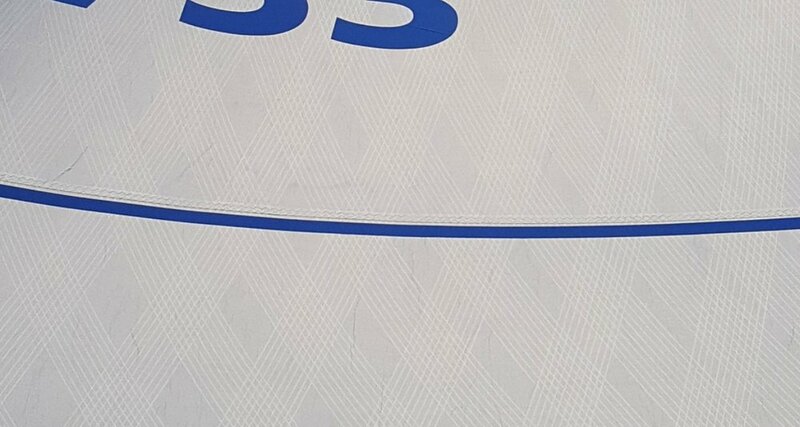 Right: Close up of S-Glass tapes on a polyester/mylar laminate that makes a white sail. German UK Sailmakers customer Jan Pieter posted on his Facebook page this about X-Drive sails on his Beneteau First 31.7 LOORA3: “A huge thanks to Stefan Voss and Timo Erps for the best new sails! I'm happy!" Richard Benedon's Beneteau Oceanis 55, RUBY D'EAU, won a very competitive 11-boat PHRF B class in the Santa Barbara to King Harbor race with a full UK Sailmakers inventory that included X-Drive Lite Skin furling main and jib. Above left is Paul North's Arcona 380 EMPIRE II, which won the entire Liros Cup 2017 in Stockholm by 20 points racing with a full suit of X-Drive sails. The event consists of 5 races, Around Lidingö, Around Ornö , crustaceans stuff, Hyundai Cup and the GranPrix. The picture above right shows the shape of his No. 1 genoa. Below is a Beneteau 57 with a set of X-Drive performance cruising sails. Ask your local UK Sailmaker how our X-Drive construction method can be used to meet your sailing needs.